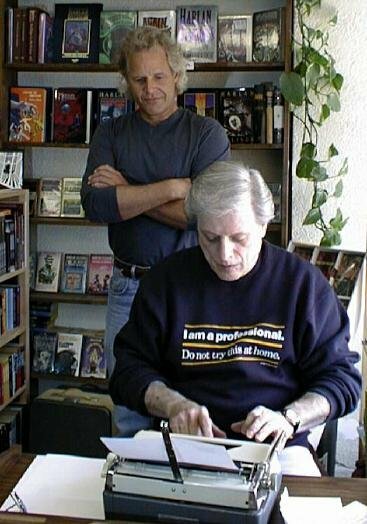 I am fascinated by the story of Harlan Ellison. I wrote a post about him five months ago. And I am really interested in his writing in the window of a book store. He wrote stories in the from the start of the day to the end of the day and he would put the pages up in the window as he finished them. And the pages would be clean and error free. He did this many times over the years. Apparently some of those stories he wrote in a window won awards. But as of this moment I am not sure which ones those are. Now Ellison won a lot of awards for his short stories. I just wish I knew which ones where written in a store window. One story I do know that he wrote in a window was Objects of Desire Are Closer than They Appear. And the premise for the story was given to him by Chris Carter. Carter gave him the phrase a 102-year-old pregnant corpse. Some began to believe that Harlan was cheating by already having ideas for his stories planned out before he sat in the bookstore window, so eventually he would get people to give an idea. Robin Williams gave him the phrase “Computer Vampyre” and Ellison wrote the story Keyboard. Ellison did not let writers block get in the way. Writing is fun. Writing in enjoyable. 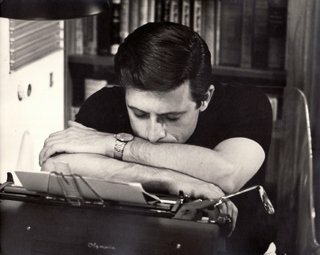 And more than anything else, writing isn’t about rewriting to get it perfect, a lot of his stories he taped to the window as he finished them. Remember this was on a typewriter, not a laptop. 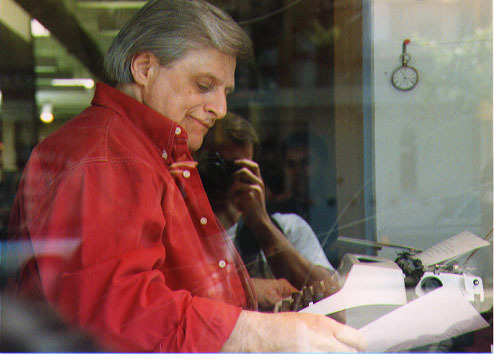 Harlan writing at the Booksmith in May of 1994 at the Booksmith in San Francisco. Just cool as all get out. This entry was posted in Choose Yourself, Indie Writing, Writing on January 19, 2018 by mctiller. The latest book in The Dolbin School Series is here. The Kindle version came out in December. But the paperback version took a few tries to get the cover correct. Come to find out there was a bug in the latest version of Photoshop that caused vertical type to be processed incorrectly when turning the PSD file into a PDF. But now we have it fixed. The book is enrolled in the Kindle Matchbook program, so you can buy the paperback and get the Kindle version for free. Click here to get the book on Amazon in paperback or Kindle. This entry was posted in Announcements and tagged Dolbin School for the Extraordinary, Finals on January 15, 2018 by mctiller.